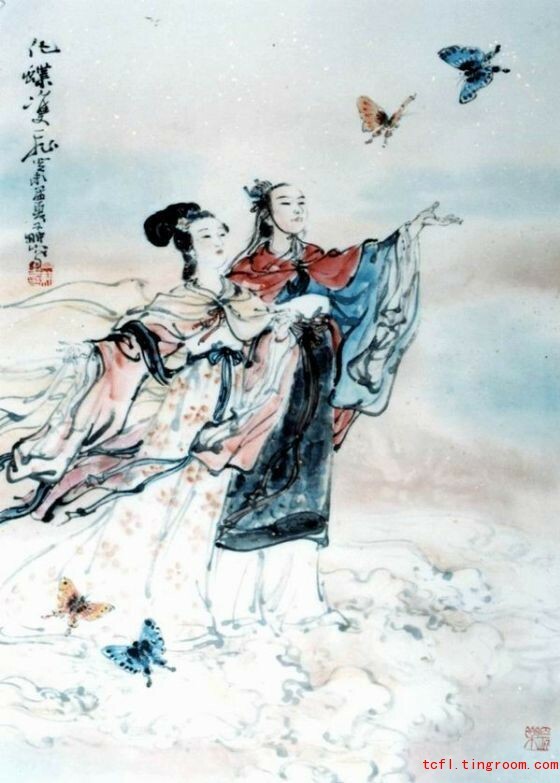 Liang Shanbo and Zhu Yingtai is one of the four Chinese folk legends and one of the most influential types of verbal art. Having been spread far and wide in China for over 1600 years, it was awarded the fame of "A faithful-love masterpiece through the ages" and the title of "Oriental Romeo and Juliet". Appearing in the Jin Dynasty 1600 years ago, the Legend of Liang Zhu goes like this: To pursuit her studies in Hangzhou, Zhu Yingtai disguised herself as a man. After studying for three years together with her schoolfellow Liang Shanbo, Zhu Yingtai fell in love with the intellectual. Before the farewell, Zhu Yingtai dropped hints again and again to Liang Shanbo who failed to understand it at that time. Later, after being clear about Zhu Yingtai's intentions, he headed for the Zhu family to propose marriage. Unfortunately, Zhu Yingtai had been betrothed by her father to another man. Liang Shanbo was so grieved that he finally suffered decease and passed away. Zhu Yingtai headed for Liang Shanbo's tomb to offer sacrifice to him on the day when she got married. At the time she held the memorial ceremony, it winded and rained, with thunder flashing in the sky. After a while, the tomb blew out and Zhu Yingtai sprang into it. Later on, the lovers turned into a pair of colored butterflies and flied wing to wing in rainbowed sky. With touching plot and magnificent imagination, Legend of Liang Zhu is very popular with common people. A gigantic system of Liang Zhu culture has come into existence. It is comprised of various literary and artistic works including the Yue Opera Liang Shanbo and Zhu Yingtai, violin concerto Liang Zhu and the film Liang Shanbo and Zhu Yingtai, and also, the peculiar fashion of pursuing studies as well as love and marriage. When going round, the legend has been continuously enriched and developed by people in various regions. At the same time, numerous gravestones, temples and other buildings were built, with Legend of Liang Zhu as the theme. Furthermore, this legend has been spread to many countries such as North Korea, Viet Nam, Burma, Japan, Singapore and Indonesia with unequalled influence.